Carillon bells are bolted to steel or wooden beams and do not move in performance. Instead, the clappers, which are connected by a direct mechanical linkage to the keys of the keyboard, move to strike the bell. The carillon's mechanical playing action, like that of the piano, gives the performer the ability to control dynamics and phrasing by variation of touch. Although the traditional carillon keyboard (sometimes called a clavier) shares some similarities with other keyboard instruments, performance technique is unique to the carillon. The keyboard has a manual key (played by the hand) for each note in the carillon. These keys are sometimes called batons because they are wooden levers about 2 feet in length, and rounded at the playing end, resembling batons. In addition, there are one to two octaves of pedal keys, played with the feet, that pull down the corresponding manual keys. This permits a performer to play the heavy bass bells with the feet, while still using hands in the middle and upper octaves. Up to six bells can thus be sounded at once. Generally it is not musically desirable to do so, however, because the rich overtone structure of bells produces a muddy, dense effect when too many are sounded at once. Although the keys are played with a closed fist, the carillonneur does not "pound" or "beat" the keys. 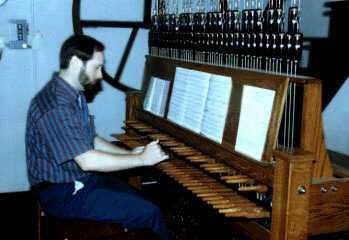 A properly adjusted and maintained carillon allows the performer to play with a minimum of effort. The motion of the key is carried to the bell's clapper by a wire, usually made of stainless steel. In the bell chamber, the wire is attached to a transmission system that transfers the motion from a vertical wire to a horizontal wire that pulls the bell's clapper (see illustration at the right). At rest, the clapper is about 2 inches from the bell wall. Immediately above the key is an adjuster that allows the performer to compensate for changes in wire length due to temperature changes. The keyboard should be located close to the bells to keep the mechanical connections short, allowing for more precise playing. When the keyboard is too far from the bells, the mass of long wires keeps the clapper against the bell too long, deadening the sound. On large bells, gravity is sufficient to pull the clapper back from the bell; for smaller bells, return springs are needed to pull the clapper back quickly. While at first glance it may seem that an electric mechanism might be better than a mechanical action, no electrical system has yet been developed that permits expression through variation of touch, as required for proper musical performance. Electrical strikers hit the bell with the same force every time, so none of the great dynamic range of the bell is available to the performer. In addition, such actions are less reliable, and more expensive, than mechanical action. Some carillons have automatic mechanisms that act as clock chimes, playing the Westminster Quarters or other tunes and striking the hour. Electric action is well suited to such simple tunes. Occasionally, three to five bass bells are arranged to swing in a peal. The sound of such a peal is glorious, but outside clappers must then be used for the carillon action. If this is not done carefully, these bells can be more difficult to play than the rest of the carillon.